This photo was taken during an inspection carried out by an experienced Geoetchnical Engineer from ESWNMAN Pty Ltd in previous project within Sydney Region during period from 2010 to date. Bored cast in-situ piles are often used as an efficient and cost effective means of constructing temporary or permanent retaining walls. Typically used in the construction of new build basements, substructures in close proximity to existing structures requiring restraint and where working space is limited. The techniques avoids excessive excavation and assists in the control of ground movement. Typically there are three types of bored pile in current use. Typically this technique is suitable to retain stiff and cohesive subsoils and where ground water levels are below the eventual depth of excavation. Pile diameters range between 450mm and 900mm and are generally installed at pile centres of between 500 and 1000mm respectively thereby leaving gaps between the piles between 15 and 100mm. This type of construction is in many ways similar to the contiguous bored pile method, except the gap between the primary piles is filled with a secondary ‘soft pile’ consisting an unreinforced weak concrete mix constructed to a depth just below the depth of final excavation. A sequence of secondary piles are constructed followed by a sequence of primary piles constructed to the full design depth, cutting into the secondary piles and reinforced in the usual manner. This form of construction ensures that water entry into the subsequent excavation is greatly reduced. 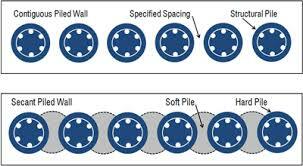 The procedure for constructing secant piles is similar to interlocking piles, save that the secondary pile is not soft but constructed of concrete similar to the primary pile and reinforced in a similar fashion to the primary pile. The equipment used to construct secant piles generally comprises a heavy duty CFA auger with rotary cutting heads. 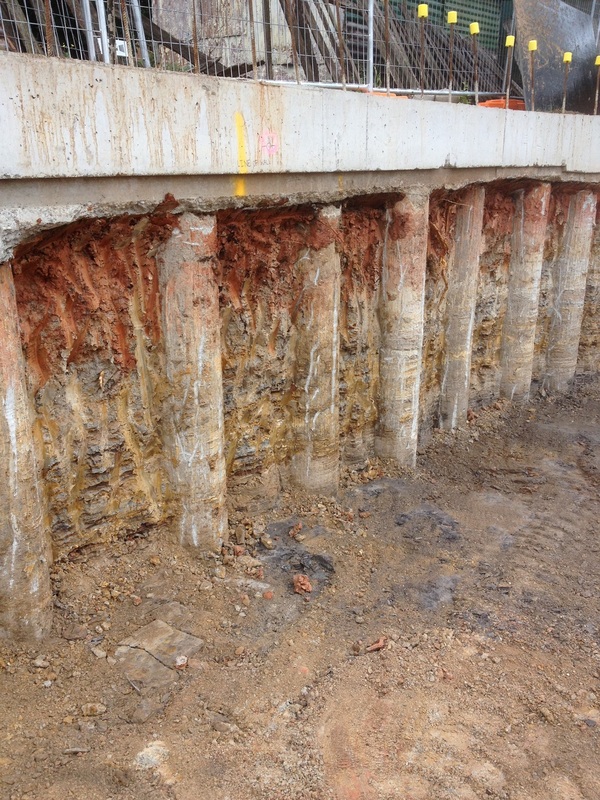 A secant pile wall when completed is a cost effective alternative to diaphragm wall construction. 2019-04-19 04:16 GMT+8 , Processed in 0.033090 sec., 26 queries .